Our bespoke built Newmarket gates have attractive vertical panelling and decorative open top detail. These Newmarket gates are fully braced to make them robust and long lasting. Our Newmarket gates can be bespoke built to your own specification, to fit your entrance exactly. All our bespoke gates take between 3-5 weeks to be built and delivered. 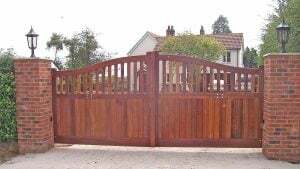 To order our bespoke entrance gates please fill in the contact form and we will contact you to discuss your requirements further.